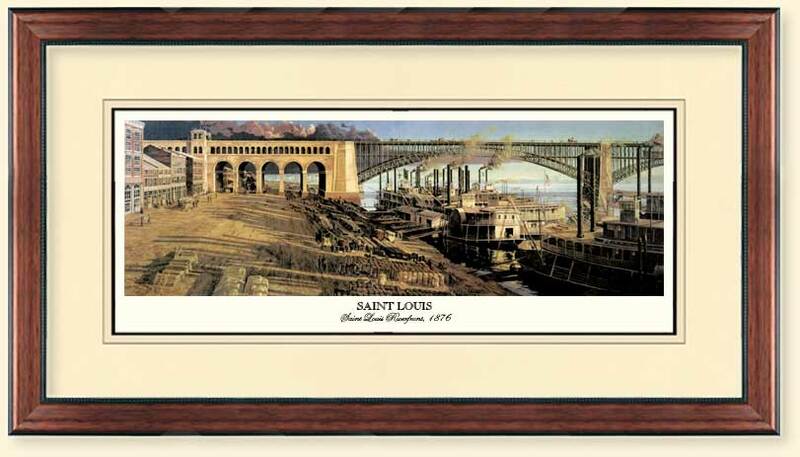 "Saint Louis Riverfront, 1876" is a painting that depicts an important period of time in the history of our country. It was during this time that St. Louis was at its zenith in regard to its importance to the commerce and development of the United States. The significant structure in the painting is the Eads Bridge. Being the first major bridge across the Mississippi River, its completion in 1874 provided an East-West link for the emerging rail system. The railroad could now cross the river and continue on its westward journey. Prior to this event, the United States commerce was limited to river and overland wagon travel. Because of the role it has played since its opening, the Eads Bridge can be labeled the true gateway to the west. A busy day is about to unfold on this summer morning in St. Louis. Among the commodities arriving at the riverfront are hundreds of bales of cotton. Additional stores of every nature are in a state of arrival or departure from this busy inland port. This was a commerce that was significant to westward expansion and development. The bridge and steamboats combine to illustrate the importance of the riverfront to St. Louis and the country. The romance of the steamboats along with the clatter of horses' hooves and wagon wheels on the cobblestone levy indicate that today, like all others, is going to be a busy one.